Handball is becoming common in Olson Forum. Photo courtesy of Moshe Mukori. On Friday, Nov. 3, 12 Concordia students piled into one of two vehicles for an eight-hour drive to Milwaukee — but that wasn’t the beginning of their story. Less than a week earlier, Moshe Mukori—a sophomore from Harare, Zimbabwe—got approval from the school to bring his club handball team on the trip to Wisconsin for a weekend series with Milwaukee United Handball Club. Mukori had only four days to get all the details of the trip finalized after the school approved the travel. In the end, the travel worked itself out, and the group started off at 9 a.m. on Friday in the small motorcade of a borrowed van and one of the team member’s personal cars bound for eastern Wisconsin. They arrived in Milwaukee at 7 p.m. and almost immediately played their first game, losing 30-25 to their hosts. Concordia then played two games on Saturday, losing the first match 39-27 before winning the finale by a score of 10-9. One of the Concordia students making the trip was sophomore Keith Sullivan, a goalie on the Concordia soccer team, who was asked by his friends on the handball team to go with them to Milwaukee to fill their empty goalkeeper spot. 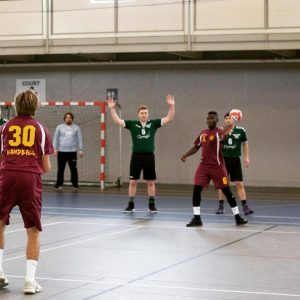 Both Milwaukee United and Minnesota THC are adult club teams that are members of the Midwest Team Handball League—a four-team league that organizes matchups between its member clubs. The MTHL was founded in September and is open to teams located in USA Team Handball’s Midwest Region. The region includes North and South Dakota, Minnesota, Michigan, Illinois, Indiana, Ohio, Iowa, Kentucky, and Wisconsin. The other two teams in the league are based in Illinois. For Concordia, this year marks the first full year of the program after it was officially granted club status by the college last January. Since then, Mukori has organized practices, created jerseys, and recently began trying to start a women’s team as well. Many of the members from last year form the core of this year’s squad, including sophomore Ian Kruse. Kruse heard about handball from Mukori last year, and he has been a club member since its inception. Mukori has made this sort of group work a priority for the club, helping the community while building the camaraderie of his fellow team members. The club will finish off its slate of fall semester matches with a game at Minnesota United this week in Minneapolis, but they have practice every Tuesday and Thursday night from 8 to10 p.m. in Olson Forum. Anyone is free to join. When the Concordian covered the handball club last April, the group had few participants, hardly any money, and had yet to play a game. That has all changed, and this group is headed in the right direction towards becoming a mainstay on campus.